Traveling to Nicaragua with a group of strangers is the most life changing, humbling experience anyone can have and thanks to the VIDA organization I was able to fully experience the culture After this trip is when I realized the true meaning do why this group is called VIDA, translates directly to ``life``! Nicaragua is the second poorest country in Latin America and access to basic health care services is an ongoing challenge. Suffering high levels of malnutrition and lacking basic medical care, Nicaragua ranks 103 out of the 128 countries evaluated in the Nutrition and Basic Medical Care Index. Therefore, Nicaragua has always been a high priority for Vida and we were ecstatic when we were able to expand our efforts to this amazing country in 2010. 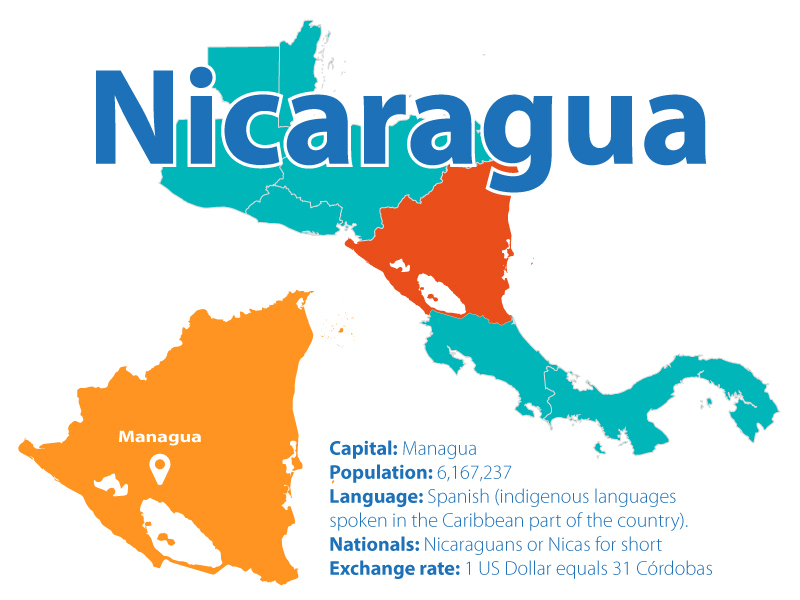 Nicaragua is the largest country in Central America, bordered by Costa Rica to the south and Honduras to the north. Language: Spanish (indigenous languages spoken in the Caribbean part of the country). Nicaragua is known for its diverse and beautiful landscape that includes volcanoes and unique freshwater and marine habitats. These diverse environments support an incredible diversity of wildlife, including many important areas for birds like Ometepe Island. Having two of the oldest standing cities in the Americas, (León and Granada) Nicaragua is full of cultural and religious traditions that are deeply embedded in their roots. Especially noteworthy are the Gueguense traditions (Intangible Cultural Heritage of Humanity according to UNESCO) that remain alive to this date. The mixing of Spaniard and indigenous customs has created warm and lovely people. Nicaragua’s climate varies since it’s a large country with many different altitudes. The Pacific side of the country tends to be very hot with strong rains from May to November and dry dusty winds between December and April. The temperature ranges from 70 to 80 degrees Fahrenheit so it’s important to stay hydrated! Our trips start in Managua, the capital of Nicaragua, where our teams spend the first night in one of our partner hotels. Orientation is held the next day and once it is completed, our teams travel to their designated communities. With the exception of Ometepe, all Vida communities are located in the surrounding areas of Masaya, Granada and Diriamba. Masaya, the cradle of Nicaraguan Folklore, is where our renowned Homestay families are located. Our internship abroad students will typically spend 3 to 4 nights with our amazing host families. Our volunteer opportunities in Nicaragua feature a wide variety of recreational and cultural activities including dance lessons, pottery workshops, swimming in a volcanic lagoon, visiting the Masaya volcano or taking a boat tour around the 365 Granada islets in Lake Nicaragua. Where do we work in Nicaragua? Vida works together with communities that have been reported to have low health indicators by the local Health Authorities. Most of these communities are located in rural areas surrounding the cities of Granada, Masaya and Carazo. We also serve some communities around the beautiful Ometepe Island. Please note due to civil unrest in Nicaragua there are no trips scheduled to this country in the upcoming months. Read the full statement at this link.